On the back of the collage, Delany wrote "Bulstrode 12 August 1778, The Day the King and Queen and the Royal Family were at Bulstrode”. 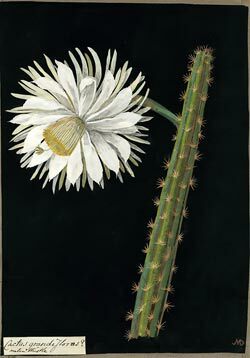 The world of botanical art can be slow to accept the use of non-traditional media. Watercolor on paper has historically been the gold standard, with other paints and colored pencils accepted somewhat reluctantly. Yet for over 200 years, botanical historians and artists have recognized the beauty and innovation of bits of cut paper and glue—the paper collage plant portraits by Mrs. Delany. In the late 18th century, the 72-year-old Mary Granville Pendarves Delany (1700–1788) began making cut paper collages in the manner of a botanical painting, or as she described it “…a new way of imitating flowers”. Over the next ten years, she created roughly 1,000 of these paper “mosaicks” that are of such accuracy and artistry as to be compared to the great botanical illustrations of the day. When completed, they were bound into ten volumes to become the Flora Delanica . Delany’s method was to form the plants from pieces of wallpaper or hand-colored paper that she had cut with a scalpel and small scissors. (This alone was a marvel of manual dexterity given what age can do to the fingers.) 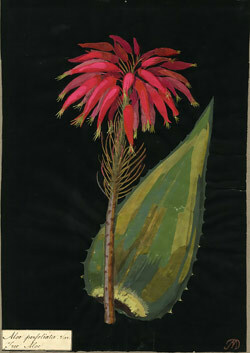 Occasionally parts of plants were incorporated into the collage. Like any botanical artist, she worked from actual plant specimens to arrange and color her creations to ensure accuracy. The tiny paper shapes were glued to a solid black background, an unusual and dramatic choice, as botanical art has traditionally presented plants on white or beige paper. Each plant mosaick was labelled with its correct identification according to the Linnaean system along with the location of the specimen’s collection. By the time she created her mosaicks, Delany had spent an entire lifetime studying natural history and practicing various arts and crafts. After the death of her second husband, she lived for a time at Bulstrode Park, the estate of her friend Margaret Bentinck, Duchess of Portland, where she had access to her friend’s botanical garden, its botanists, and the largest natural history collection in England. At age 82, Delany’s eyesight failed, and she was no longer able to create her plant mosaicks. Three years later, the Duchess of Portland died. King George III and Queen Charlotte had often visited the two women at Bulstrode, and after the death of the Duchess, the King provided Delany with a cottage at Windsor and an annuity. She spent evenings with the royal family, teaching the children and helping the Queen with her own pressed flower collection. Delany died in 1788 after a brief illness. In 1896, Delany’s Flora Delanica was donated to the British Museum, where today these unique works can be viewed in the Museum’s online collection. This appeared in the November 2015 issue of The Desert Breeze, the monthly newsletter of the Tucson Cactus and Succulent Society.